When it comes to Apple , its revolutionary products and its iconic founder, Steve Jobs, have usually been the places where the media has shone its spotlight. The curious case of Apple stock itself, however, is almost as interesting. For the past decade, it has defied gravity, climbing up 5,825%. But the most intriguing part of the Apple stock story began with Jobs' death in 2011, and it carries on to the stock's confrontation with the Law of Large Numbers today. A close look at the stock's story reveals just how mad the market really is. "Apple is a normal company. Why does the public constantly expect them do the impossible?" vented Slashdot commenter "pi radians" more than a decade ago. The quote was buried in a discussion forum titled "Apple releases iPod," dated Oct. 23, 2001. At an invitation-only event, Apple had just released its new MP3 player. Little did pi radians know that Apple was just getting revved up. The company, and Apple stock, surely went on to do the impossible, blowing away investor expectations. The iPod dominated the MP3 player market and was the driving force in the decline of the CD. As Apple continued to astound consumers, Apple stock followed suit. The stock rode the waves of one successful product launch after another, including the iPod Mini in 2004, the iPod Touch and iPhone in 2007, and the iPad in 2010. An investor who bought $100,000 in Apple shares 10 years ago would have almost $6 million today. Then, on Aug. 24, 2011, Jobs resigned from Apple, as his illness made it impossible for him to "meet [his] duties and expectations as Apple's CEO." Less than two months later, Jobs died. Not long afterward, Apple's stock began to soar as the company's iPhone and iPad line continued to obliterate expectations. "Apple's monstrous quarter" was common earnings-release headline lingo. And now, after a meteoric rise to $700 per share in September 2012, Apple stock now hovers near its 52-week low, around $428. Apple's 5,825% rise over the past year had little to do with investor optimism. In fact, the company's earnings and free cash flow growth both outpaced the growth in the stock price. But what makes the Apple stock story really interesting is that even at $700 per share, Apple appeared to be fundamentally cheap, trading at about 16 times earnings. As a comparison, Google trades at 24.5 times earnings. When it comes down to it, the iPhone 5 didn't live up to the Street's expectations. Google's free Android mobile OS has empowered an onslaught of competing devices at lower price points. Many consumers aren't as willing to shell out premium dollars for a smartphone when they can find a cheaper alternative elsewhere. Ultimately, stock prices are all about expectations. Investors expect Google to continue to grow its revenues and earnings and, hence, its business, so the stock trades at a nice premium of 24.5 times earnings. In other words, investors expect Google to grow into its stock price. AAPL EPS Diluted Quarterly YoY Growth data by YCharts. Growth rates exceeding 25% no longer seem attainable. In three of the past four quarters, Apple reported decelerating year-over-year growth rates in EPS. But the tension persists. Analysts, on average, expect Apple earnings to increase at 20% annually for the next five years. At just 10 times earnings, however, this expectation isn't priced into the stock. On Apple's Motley Fool CAPS page, 61 of 61 analysts rank Apple stock as an "outperform." Even so, the market refuses to pay a premium now for an expectation of growth down the line. Now investors are wondering what's next. Is Apple stock exiled from growth portfolios and reassigned to the income investment community once and for all? 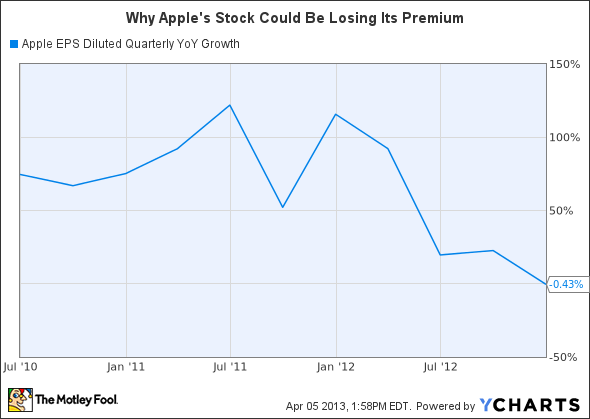 With a very likely dividend boost just around the corner, Apple might morph into a great dividend stock. But will it ever be a growth stock again? Let us know your thoughts. There's no doubt that Apple is at the center of technology's largest revolution ever and that longtime shareholders have been handsomely rewarded, with more than 1,000% gains. However, there is a debate raging as to whether Apple remains a buy. The Motley Fool's senior technology analyst and managing bureau chief, Eric Bleeker, is prepared to fill you in on both reasons to buy and reasons to sell Apple and what opportunities are left for the company (and your portfolio) going forward. To get instant access to his latest thinking on Apple, simply click here now. Editor's note: A previous version of this article incorrectly stated an investor who bought $1,000 in Apple shares 10 years ago would have almost $6 million today. The Fool regrets the error. The article Apple Stock: Goodbye, Growth; Hello, Income originally appeared on Fool.com. Fool contributor Daniel Sparks has no position in any stocks mentioned. The Motley Fool recommends and owns shares of Apple and Google. Try any of our Foolish newsletter services free for 30 days. We Fools don't all hold the same opinions, but we all believe that considering a diverse range of insights makes us better investors. The Motley Fool has a disclosure policy.